On Sunday 24 August 2003, cast and crew of the Rowdy Herrington film Bobby Jones: Stroke of Genius (2004, USA) began shooting scenes on the Old Course in St Andrews. The independent production companies – the US based Bobby Jones Productions and Scotland-based McDongall Films – secured permission to film from the Links Trust with the help of Tayscreen, the Screen Office for local councils. 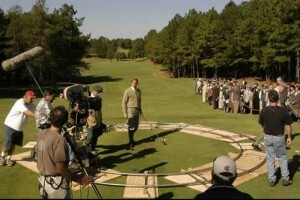 In so doing, it became the first feature to film its golf sequences on the Old Course. The production would remain in St Andrews for a few weeks, leaving the town on 12th September 2003. More than 20 years after the filming of Chariots of Fire (1981, UK, Hudson), St Andrews was once again the location for a feature film set in the 1920s which celebrated traditional values, triumph over adversity and sporting endeavour. In this case, Bobby Jones: Stroke of Genius tells the story of American golfer Robert Tyre Jones Jr, who remains a hugely significant figure within St Andrews’ history. Having won both the British Open in 1927 and the British Amateur Championship in 1930 on the Old Course, Bobby Jones would later receive the Freedom of the City in 1958. The film was intended to consolidate Jones’ legacy – both within the town and internationally – and indeed was partly imagined as a fundraiser for a number of charities. Today, the University offers scholarship programmes in his name. The stars of the film – which include Jim Caviezel, Claire Forlani and Malcolm McDowell – worked alongside many local actors who were recruited as extras in two casting sessions held at the Macdonald Rusacks Hotel. Speaking of his experiences as an extra in the film, Alan Woolley told The Citizen that it was “tremendous and a lot of fun” appearing as “background golfers on local courses” (The Citizen, 10 September 2003). With more than a thousand extras recruited by the Perthshire-based company Casting Call, the Bobby Jones film used North East Fife to represent a number of locations across the UK. The crowds of 1920s golf spectators largely comprised local extras. The film enjoyed a ‘gala’ premiere on 9 June 2004 at the New Picture House in St Andrews, which was followed by a fundraising event in the University’s Younger Hall. For St Andrews, Bobby Jones: Stroke of Genius further cemented the long-lasting relationship between Bobby Jones and the Scottish town, while once more showcasing, for international audiences, the iconic scenery on the big screen.